There have been a lot of posts on this blog over the years, many were just plain rants against the food system as I learned more about it and how broken it is. Thanks, all, for sticking with me in those Don Quixote moments tilting against the windmills of Big Ag. Those few corporations that control so much of US food system (and our political system) are veritable giants. It's easy to feel powerless, even after eight years of writing for Eat Local Challenge and being part of this food movement. I'm heartened. You see, I believe each of us has the power to make choices, that ultimately we consumers will make the change that needs to happen for better food. But, we still have a long way to go. And if we are going to be successful, we need to be sure that we don't leave behind the population who has limited choices. We're in this together. We can do this thing. We've had a fairly odd winter this year, as in almost no winter. So, forgive me if I am busting out with the spring recipes before the season officially arrives. It's going to be over 60 tomorrow, in February. So, let's cook something for spring. This dish is a great Easter dinner side, either an appetizer course, or a starter to follow the Asparagus and Potato Salad with the Lemon-Mint Dressing and Hard-cooked Eggs. I see the main course as maybe a roast leg of lamb, and a light panna cotta, but I'll get to the dessert and main closer to spring! First, trim the sharp points from the bottom two-thirds of the leaves with kitchen shears. 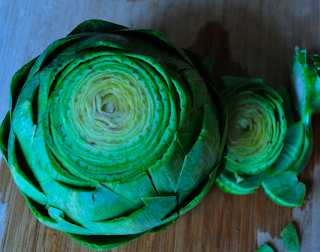 Then, trim the stalks to be flush with bottom of artichoke. Using a chef's knife, cut off the top 1/4 leaves (see photo). Rub the cut edges with lemon. Place the wine and extra water, if needed, in the bottom of a steamer, stove type or the steamer appliance. Squeeze the lemon into the steaming liquid. Steam the artichokes for 25 minutes. Mix the remaining ingredients in a small bowl, tossing the oil with the bread crumbs and cheese until its a nice crumbly mixture. 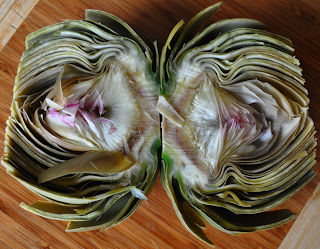 When the artichokes are done steaming, lift them out with tongs onto a cutting board. 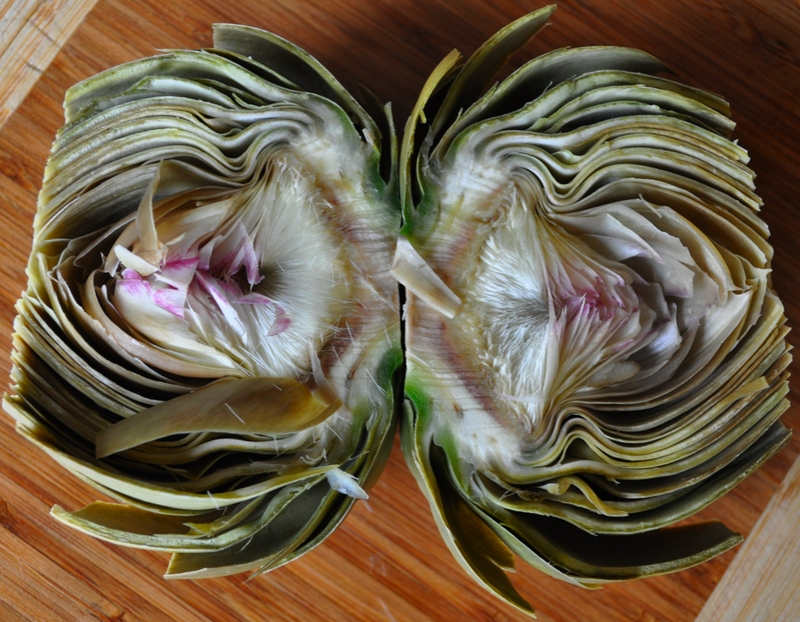 Slice each artichoke vertically in half. 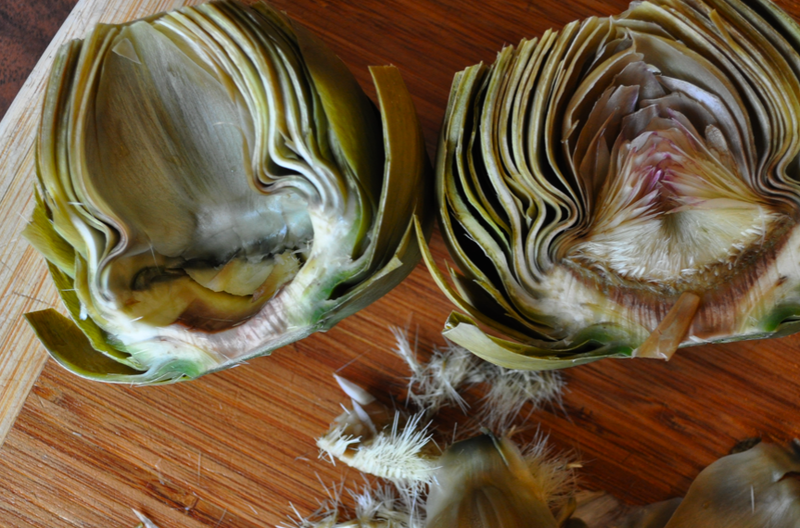 Using a paring knife, remove the rough part of choke and the center few purplish leaves (see photo). This leaves the lovely, edible heart easy to get to, and makes a nice cavity for the bread crumbs. Sprinkle the bread crumbs, a bit in the cavity, but also in between the leaves throughout. Place on a baking sheet with non-stick spray. Roast for 7-9 minutes until the cheese is melted and bread crumbs are browned. Serve hot. I did a terrible job of getting this posted during Thanksgiving. We had a small holiday dinner with friends before we all had to spend our actual holiday with extended family and the big, potluck fun for that day. For the four adults and three kids here, we could cook a special menu, a bit less traditional and upscale. 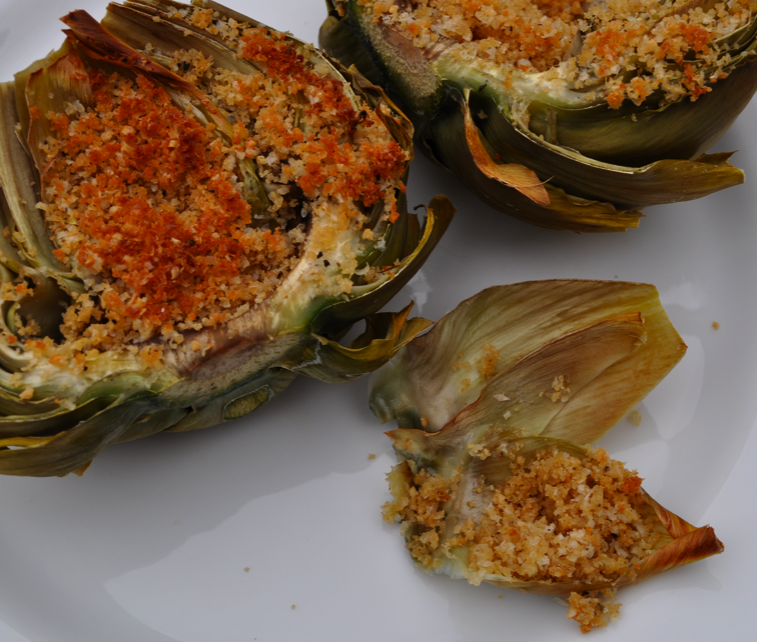 If you have a small gathering, this is a great alternative Thanksgiving menu to try. For the salad course, I recommend the Fall Kale Salad, and for dessert, the ultra-easy (make ahead) and stunning Pumpkin Panna Cotta with Bourbon Pecan Toffee. Starting from the large cavity end, gently work your fingers between the skin and meat to loosen skin from the ducks, especially the breast as much as possible. Try not to tear the skin. Prick the skin all over with a fork to allow the fat to drain when cooking. Stuff the duck cavities with the orange, celery and onion. Salt and pepper them lightly. On the stove, bring the apple juice and mulling spices to a boil. Pour the boiling liquid over the ducks to tighten the skin. The liquid need to come up at least halfway to two-thirds up the sides of the ducks. You can add chicken stock if you need more liquid. Cover the pan tightly with foil. Put oven rack in middle position and preheat oven to 350°F. 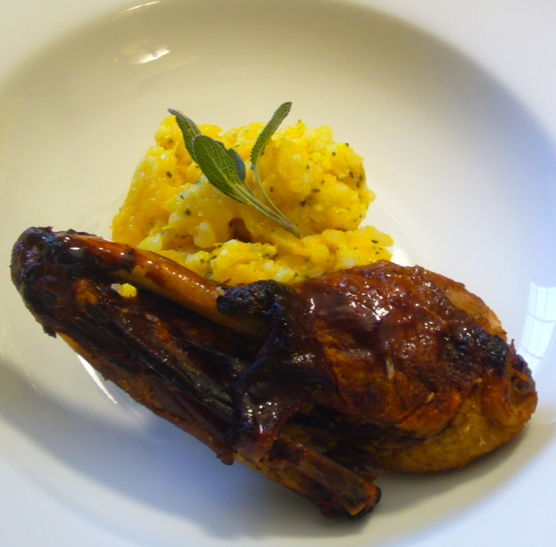 Braise for one hour, remove from oven and turn ducks over, cover again and braise for another hour. Remove from oven. Transfer ducks to a large platter, draining any juices inside ducks back into pan. Pour the cooking liquid from the pan through a strainer into a large bowl. Place the ducks back in the roasting pan and chill both the large bowl of cooking liquid and the ducks, uncovered, at least 4 hours. You want to firm up the duck before the roasting step, and also solidify the fat on the cooking liquid. Remove the bowl of cooking liquid from the refrigerator and skim off the fat. Measure 1 and a half cups of the liquid and add to a large sauce pan on the stove. Add two cups port, 1 cup balsamic vinegar, and 1/3 cup cranberry jelly, and 1 Tbs. Dijon mustard. Whisk and bring to a simmer, uncovered. Reduce over low heat until you get a syrup that coats the spoon, about a half an hour. Remove the roasting pan with ducks from the refrigerator and place in oven. Roast ducks until skin is crisp, about 20-25 minutes. When done, transfer ducks to a platter and let stand at least 10 minutes before serving. Glaze lightly with some of the sauce, serve with remaining sauce. On stove, or in a steamer, steam the pumpkin until fork tender, about 15 minutes. Set aside, keeping warm. Heat the chicken broth in a small saucepan, and keep it warm over low heat. In a large pot, heat 2 tablespoons olive oil over medium-low heat and sweat the shallot until translucent, about 5 minutes. Increase the heat to medium-high. Add the rice, and stir until it is evenly coated with oil, and the grains just begin to turn golden, about 3 minutes. Add the wine and cook, stirring often, until the rice absorbs the liquid, about 5 minutes. Stir 2 cups of the warm chicken broth into the pot. Now you’re free from stirring for about 8 minutes, until the rice absorbs the liquid. After this step, you need to start stirring frequently. Add another cup of the warm chicken broth to the pot and cook, stirring frequently, until all the liquid is absorbed, about five minutes. Add just 1/4 cup of broth next, and cook, stirring constantly, until all the liquid is absorbed, a few more minutes. Taste the rice; if it has reached al dente texture, you’re done. If not, add another 1/4 cup of broth and cook, stirring constantly, until all the liquid is absorbed. Repeat until the rice is done; you may not need all of the broth. Mix in the Gruyere, gently fold in the cooked pumpkin, and sage. Season with salt and pepper to taste. Serve alongside the Crispy Duck, drizzle with the Cranberry-Port sauce. Beans, corn and squash are known in Native American food culture as the "Three Sisters" because of the practice of companion planting these items together to feed the soil, help provide structure for the climbing beans and decrease weeds. The fact that the beans are available dried in winter, along with my stash of winter squash, and corn that was frozen from summer, means local eating in winter, too. The hearty soup does include a smoked pork shank for flavor, but this is optional if you want a vegetarian soup. The three sisters also provide a good vegetarian protein balance without the need for meat here. I use my handy, and rather large pressure cooker here. 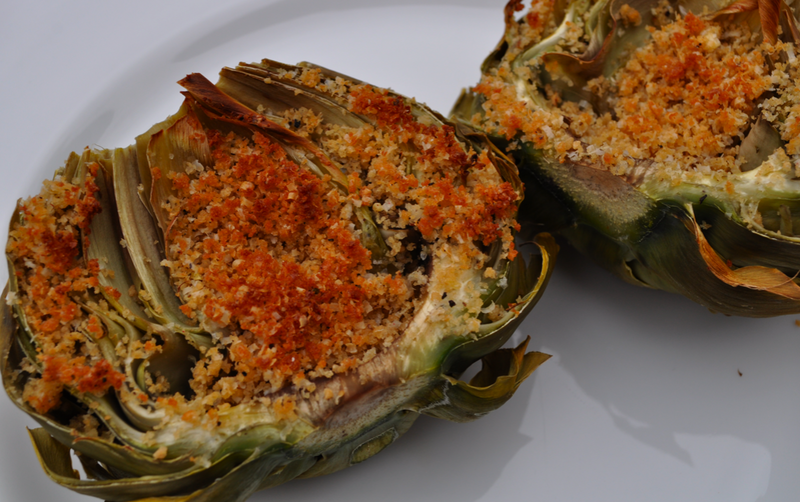 To do this without a pressure cooker, plan on a cooking time of two hours and 15 minutes. It makes a whole lot of soup. Plan on freezing some for an easy dinner in the future. 1 lb. dried beans, soaked overnight, drained and rinsed (heirloom beans like anasazi or vaquero work best, kidney beans as a substitute). Heat the olive oil over medium heat. Add the onion, green chiles, garlic, cumin, Ancho chile powder, and cinnamon to the pot and sweat for 10 minutes until the onion is translucent. Add the stock, tomatoes and juices, beans and the pumpkin cubes, and pork shank if using. Bring to a boil, then reduce heat. Lock on the pressure cooker top, making sure it seals correctly. This will cook for 45 minutes. When done cooking, turn off burner and follow your pressure cooker manufacturer's directions to release the steam. When the cooker is ready to be opened, unlock the top and remove the pork shank to a cutting board. Using tongs, pull the meat from the bone. Add meat back to the pot. Bring to a simmer. Add the frozen corn and simmer for about 10 minutes. Before serving, adjust the salt and pepper, mix in the cilantro, reserving some as a garnish. Freezes well. Makes about 14-16 servings.